Being outside in nature is wonderful. There is fresh air, trees, plants, grass, wide open spaces, and usually some awesome views. Then you accidentally touch some poison ivy or poison oak and the fun is gone. Now instead of enjoying nature and all its beauty, you may well be cursing it because you are itching like crazy and your skin looks horrible with a red rash and oozing blisters on it. I currently have a mild rash from either poison ivy or poison oak. I'm not sure which because I don't recall seeing any poison ivy or poison oak when I was on my last camping trip but it must have been someplace where I wandering around. Because it's a mild case I'm trying to "tough it out" but I'm getting pretty sick of it. Nothing I've tried has stopped the itching and I can't stop myself from scratching it like crazy. 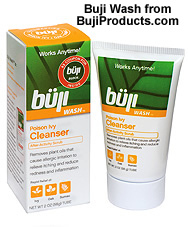 buji Wash works by removing urushiol, the toxic oil from poison ivy and related plants. Many people think that washing with soap and water will remove the urushiol from their skin but it is so thick and resin-like (think about pine tree resin and how hard it is to get off a camper or RV) that soap and water can't usually remove it and often instead spreads it, making the rash worse. buji Wash works by breaking the bond between the urushiol and your skin, dissolving the oil so it can be washed away. 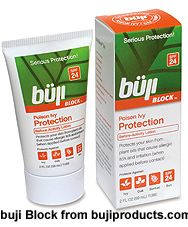 And, for people who are highly sensitive to poison ivy, poison oak or related plants, such as my husband who is so sensitive to poison ivy he no longer has to touch it to get infected - he gets a rash just by getting close to it (not sure how but I've seen it happen), buji also has a block to wear to prevent the poison ivy from adhering to skin. Buji block is applied to the skin before heading out into the great outdoors where poison ivy can be lurking. With the buji block on it's kind of like being in a plastic bubble because it acts as a layer of protection between you and the stuff that wants to make you itch. For poison ivy facts that includes answers to frequently asked questions such as, why poison ivy causes a rash, how long the rash lasts, how to treat it, can it be spread to other parts of the body, and whether or not it is contagious, click here to check out buji's poison ivy facts page. For help identifying poison ivy, poison oak, and poison sumac click on the images below to go to buji's plant identification page. Receive $6 off any minimum purchase of two büji Wash or two büji Block by entering bujicache in the coupon code box on the ordering page. Or, receive $6 off any combo purchase of one buji Wash and one buji Block by entering bujicachecombo in the coupon code box on the ordering page.